A recent study found that email and social media are the most effective marketing tools for business owners to use. And just like peanut butter and chocolate, mixing two good things make one great thing. A recent study from Sales Marketing Force focused on what happens when retailers use email and Facebook ads together. The results showed that when email marketing and Facebook are used at the same time, people were significantly more likely to act on the content. 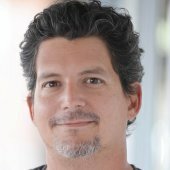 “Today, we’re excited to release a new study of a leading U.S. retailer’s combined use of email and Facebook ads, which found that people who received both email and Facebook ads were 22% more likely to purchase than those exposed only to email,” the company wrote in a blog post announcing the research. The study uses data from a major online retailer, but the researchers have been quiet about who the retailer is. Given the public tendency to blow things out of proportion when it involves Facebook and tracking results, this may have been a wise decision. At any rate, over a two week period, this online retailer targeted 565,000 email subscribers with both its regular email marketing communications and coordinated Facebook News Feed ads. In total, they analyzed data from 925,000 email subscribers when you add in the users who weren’t shown the ad on Facebook. Opened email only: 18% of the people targeted opened at least one email but did not see an ad impression. Saw ads only: 27% of the people targeted were only exposed to at least one ad impression. 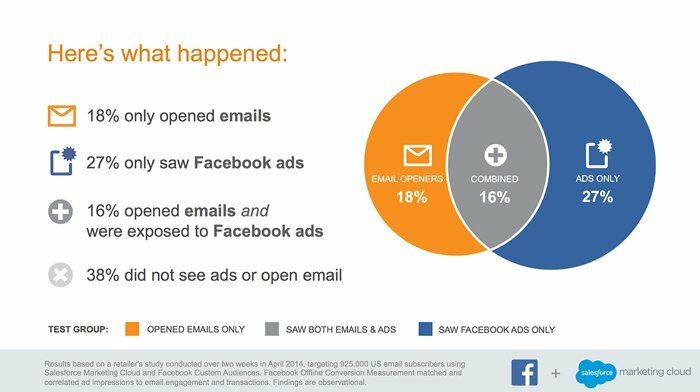 Combined: 16% of the people targeted both opened the email and were exposed to an ad impression. The study shows the value of integrated marketing campaigns and showcases an excellent tool that small business owners can use on their own Facebook ad campaigns. Just like Facebook can be used to retarget consumers who have visited a brand’s website, business owners can export their email lists and use these emails as a custom target audience. Then, if those email addresses are used to log into Facebook, they will be served the ad or promoted content. Here’s a link to all the technical data from Facebook on how to do this, though there are some guides online that are easier to understand. Not only does this study show the value of integrated marketing, is shows why more channels is better. Even when the retailer used email and Facebook to target the same users (who had opted in to the email, no less) more than one in three (38%) didn’t see the content on either channel. If the retailer also use PPC ads on Google, YouTube videos, TV, etc., the percentage of people who didn’t see any content would be much smaller. Read this article for more information on how integrated marketing can help small businesses succeed.